Brazil Gold is a Natural material. Brazil Gold is a Medium priced Granite stone. 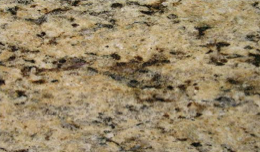 Brazil Gold granite is mostly light/dark creams & browns with some black flecks within it. It’s a warm granite and is a good choice for many kitchens, often featuring in both traditional and modern kitchen designs. If your after a cream/brown granite and this is not quite right, then please ask one of the sales team to have a look at Giallo Venezia Oro, New Venetian Gold or Giallo Vitoria. For full cleaning instructions please see our Granite Worktops Care Sheet. Brazil Gold is a Natural Granite from Brazil, Landford Stone offer this type of stone in a variety of thicknesses and finishes. Brazil Gold is a Medium priced stone and will look incredible in your home! "The workmanship from Landford Stone was faultless and we can't thank you enough for all of your help. We have no hesitation in recommending you to anyone!"